My big beast is pretty thick-skulled, but usually I mean that figuratively. Not today. Today I mean it quite literally. Today, my furry child was chasing my son and a friend upstairs, along with her furry partner in crime, and was a bit excited. So excited that she happened to not see the corner of the wall and had a collision with it. She's fine. The wall isn't. 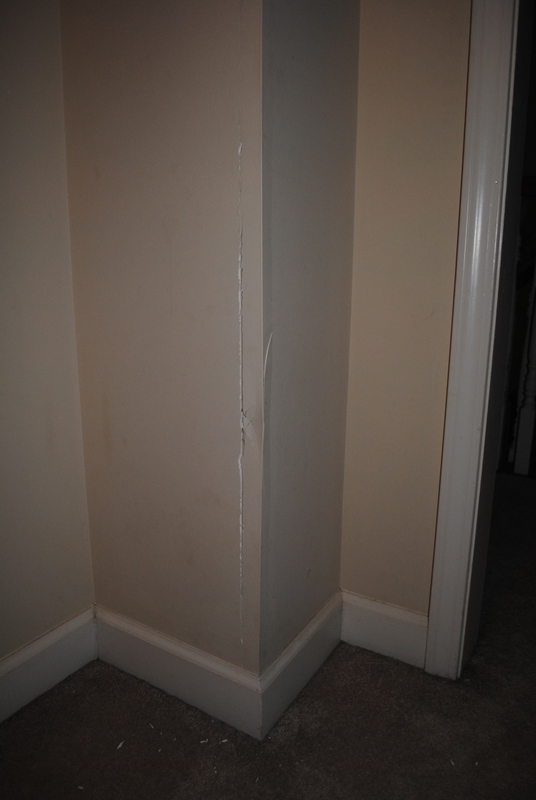 Note the pieces of drywall on the floor and how far the damage goes up. How could this have not hurt??? 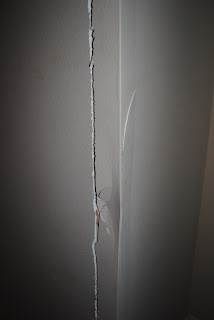 I'm truly amazed that the head of an animal could cause this much damage without so much of a whimper. 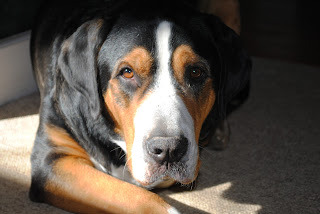 We weren't sure which dog did the damage until my daughter commented that the one had some white dust on her head. It really is unbelievable. I'm sure the bill to repair it will be equally so. I saw a post on another blog about the Jeub Family. I was intrigued for several reasons. First, having only two children, large families (16 kids!) fascinate me. Second, we own a family business, though not the type that is run out of the house. I would really love a home-based business that the whole family does together. Lastly, speech and debate is something on the "to do" list for my kids, and a free book offer on just that subject is very timely. Read the latest post on the Jeub family blog on the working of their home-based family and learn how you can be one of the lucky 100 to get a copy of Jeub’s Guide to Speech & Debate for free! I discovered the Mandie series by Lois Gladys Leppard when my daughter was young, voracious reader. It was difficult to find a wholesome book series that was appropriate for her age, yet at a reading level that held her interest. The Mandie series looked like the perfect solution. I started picking up titles second-hand when I came across them. I have over 20 of the titles, yet I don't remember my daughter reading many. I just pulled one off the shelf and discovered why - the text is on the small side and probably didn't work for her young eyes. Unfortunately, they were put away for some time. Hmm - I wonder if my daughter is too old for the series now. I entirely forgot about them until I was given the opportunity to review the new movie release, Mandie and the Cherokee Treasure. I watched this DVD with my daughter the other night. It is a wholesome story that the whole family can enjoy. As with many movies made for DVD, the acting isn't stellar. 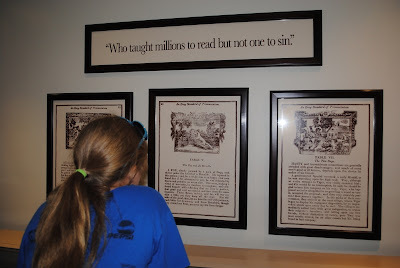 However, even at a sometimes sophisticated 13 and having not read the books, my daughter seemed to enjoy it well enough. Since the movie was not based on the first book in the series, we were missing some of the background, but not enough to not be able to follow the plot. I suspect that the comedic tone that was splattered throughout wasn't part of the original book series, so that is something to be aware of if you've been a fan of the books and are looking for a visual version with the same flavor. The story revolves around an adventure that Mandie has with her mother, whom she was recently united, two of her friends, and her Uncle John into the Lost Antler Cave-Mine to retrieve something very valuable. Of course, there are some evil conspirators in their way, not to mention the poisonous gas in the cave. Below you can watch the official trailer to get a feel for the film. The DVD comes complete with Behind the Scenes Featurettes, a gallery of over 1700 still photos, MP3 music from the soundtrack, and a printable Discussion and Activity guide. You may also be interested in going to the official site of Mandie and the Cherokee Treasure to learn more about the movie. Now, for the exciting news! I have an extra copy and you have an opportunity to win your own Mandie and the Cherokee Treasure DVD. There are several ways to enter. Please leave a comment for each and make sure you give me a way to contact you if you are the winner. Simply leave a comment that you'd like to win this item. The giveaway will end on November 12th at 6 p.m. EST and will be chosen by a random number generator.U.S. addresses only, please. Mama needs a laptop! I made it to the photo contest finals! I am so excited! I entered a photo contest through Homeschool Science Academy a couple of weeks ago. 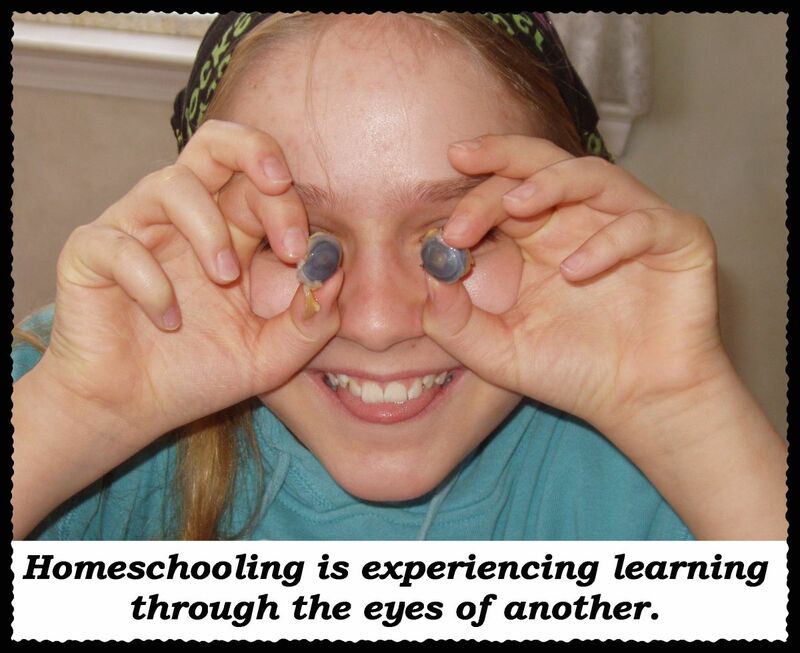 The instructions were to share a photo that captures the essence of homeschooling and include a caption of 10 words of less. I made it to the finals and the winner gets a laptop. Woot! I've been dying for a laptop. Anyone that is subscribed to the newsletter for Homeschool Science Academy can vote; you can sign up for the newsletter at the bottom of the page here. Mr. Greg Landry at the Homeschool Science Academy runs many contests with laptop prizes throughout the year, which are announced in his newsletter. He also offers great information and shares info about his classes, too. I've included my submission below. This was actually a pic I had taken a couple of years ago. When doing a fish dissection, my daughter took it an extra step and decided to take a better look (no pun intended!) at the eyeballs. She obviously isn't squeamish, as indicated by her smile despite the yellow eye guts hanging down onto her thumb. :) Oh, and don't miss the double meaning of the caption! I've learned so much through the eyes of my kids, but sometimes that caption can be quite literal too. the essence of homeschooling. We received hundreds! number of your favorite photo. You'll need to download a short recording from the online classroom to see the photos. It is very simple. My photo (remember, #21!) is the first photo in recording #3. Thanks so much for taking a look. Remember, if you are undecided on what photo you like best, just go with #21. It is an excellent choice! 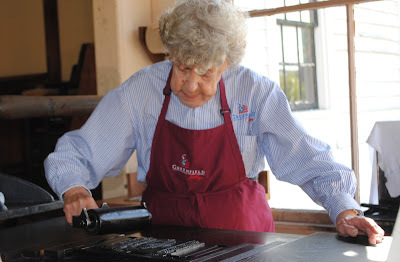 Some of you may know that our family owns a bindery. It is a third generation bindery that has been fruitful in the past, but has been struggling with the recent economy given that most of our business is automotive driven. 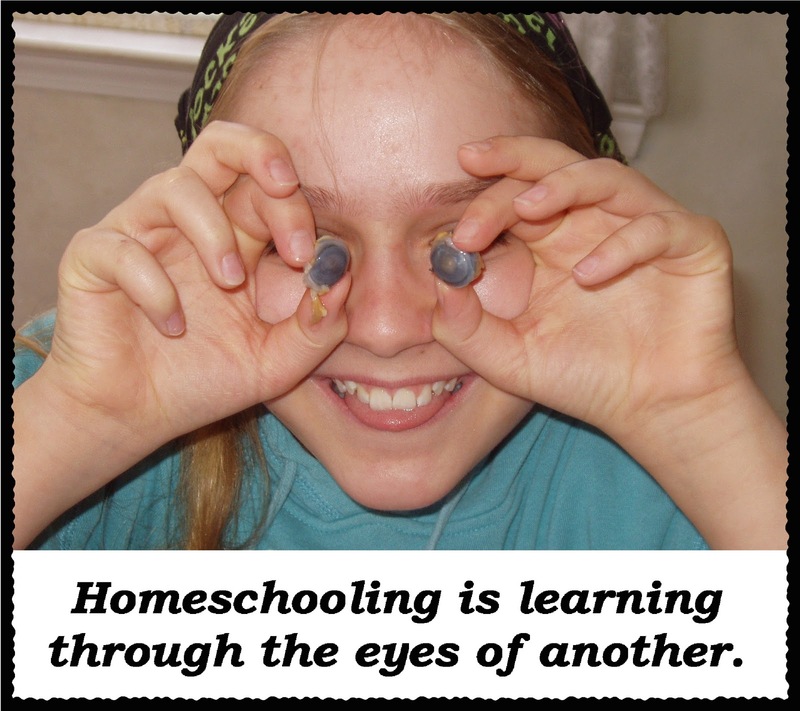 For the last two years, my husband and I have been brainstorming ideas that could use our bindery business to serve the homeschooling community, which is a little closer to our heart.We've come up with a few ideas, but they have been slow to come to realization. Creating a new product is a lot of work, especially when you don't have all the skill set needed to produce it. One product, which is almost complete, has involved a detailed cover. Have I ever mentioned that I'm pretty graphics challenged? and 1 of 100 Tos Crew Reviews. Also of great help has been Tristan of Our Busy Homeschool. Now only did Tristan give some of our products a test, but she also was the original inspiration for one of the products after I read one of her blog posts spotlighting her daughter's lapbook. I actually finally have three of the product in hand, but need to develop the website and ordering system. Did I mention I know very little about creating websites and even less about ordering systems. Yep. I guess it is never too late to learn. Who knows - maybe I'll even learn to lapbook before this adventure is over! The products are slowly coming together and we are over the developing hump. I'm very excited about our new product line and hope to announce it soon. Very soon. Announcing The Homeschool Misfit Awards! It wasn't too long after I first started blogging a couple of years ago when I heard the buzz about the Annual Homeschool Blog Awards for the first time. Having only blogged for a few weeks, if that, at that point, any nomination of the sorts was far into the future. Since then, two more years have gone by and I still don't feel any closer to any award category. There are too many bloggers out there, many far, far better than my humble blog. Apparently, I'm not alone in my feelings of inadequacy when those annual blog awards come each year. Several of my Crewmates from the TOS Crew were discussing how there just isn't a category that fits some of us. Instead, we started to joke around about suitable categories, those for the misfit variety of bloggers. You know, those bloggers that neglect a blog for weeks (The Harried Homeschooler Award), who enthusiastically announce an upcoming post but never get around to it (The Not Coming Soon Award), or perhaps who exhibit major signs of ADHD with posts that start on one topic and end on something entirely different ( The "Squirrel" Award). Now you're talking! I could actually fit in categories like this. And if I don't, there is the always the The Misfit Among Misfits Award for those that still can't find a category that fits them. Before you know it, Lori over at Hearthside Homeschooling Reviews made The Homeschool Misfit Awards a reality! How incredibly fun! Head on over and take a peek at the categories. Perhaps there is one that fits you (or a friend that doesn't mind a little fun at her expense). As for me, I can see myself in several. I just haven't decided yet where I'm the biggest misfit. In this case, there are too many choices! Homeless for the Holidays winner! The winner for the giveaway, as determined by Random.org was entry #53, jsc123. Congrats! Keep an eye out for another family-friendly movie giveaway soon, hopefully in the next week! What would you buy from CSN? What is CSN, you say? CSN has over 200 online stores that sell, well...just about anything! Looking to revamp and revitalize part of your home? Browse through the Home Improvement, Home Decor and Furniture stores. You just may find the perfect coffee table or a chic bar stool that suits your new room perfectly. Doing some early Christmas shopping? Toys, games, and housewares can all be found among the many pages of products. Or maybe you just want to gift yourself? Check out the shoes! Or, better yet, the bookcases - for us homeschooling moms. Look for a product review post soon. I have no idea what I'll select yet. Off to browse the many choices! Excellent animation on Sir Ken Robinson talk! I think you'll enjoy this video regarding education and a needed paradigm shift. Some of the points addressed are exactly why we homeschool! I haven't participated in the Blog Cruise for a few weeks, partly because I've been very busy. However, I thought this week's topic is one that I've put some thought to recently. What are some field trips that your family has enjoyed? We used to schedule field trips into our activities on a regular basis when the kids were younger. Below is a list of some of the trips we've taken over the years. For my local readers, I've included links if I have them handy. 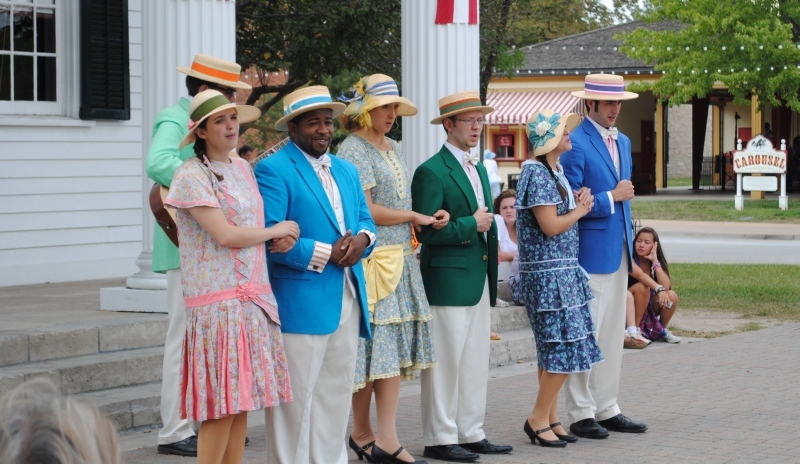 Don't forget programs with local museums and theaters. Also, when the kids were early elementary, they loved doing tours of our local bakery, fire station, police station, and post office. As you can see, we are very fortunate to live in an area with lots available to us. 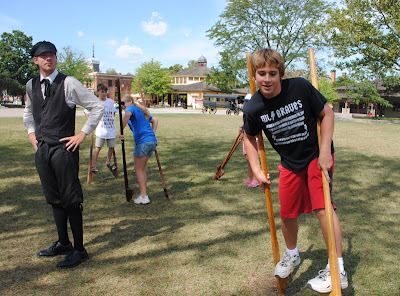 And while we haven't done many field trips lately, we did recently take advantage of a great museum that visitors to our state should be sure to visit, The Henry Ford Museum and Greenfield Village. We visited last month with some friends, a great way to kick off the school year. 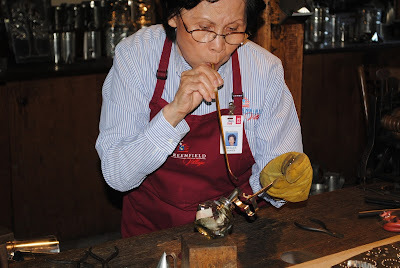 Then, the we headed over to the tinsmith to watch a tin punching. 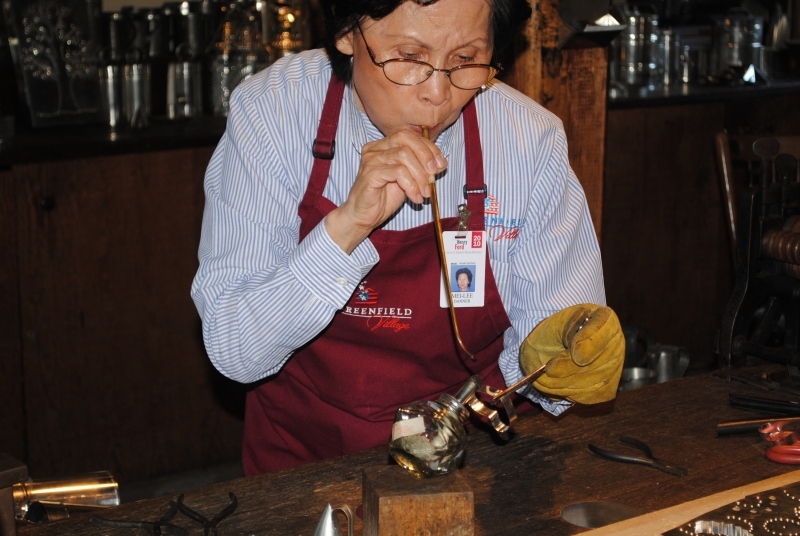 The glass shop is my absolute favorite. In the summers, they run camps for kids ages 14 and up to learn a bit about the trade and give it a try. I always thought that would be a ton of fun. Watching the process from raw materials to finished pieces, which are sold to the public in the gift shops, fascinates me. The kids were ready to let loose a little, so we headed over to the Village Green where some old fashioned toys were set out for use. 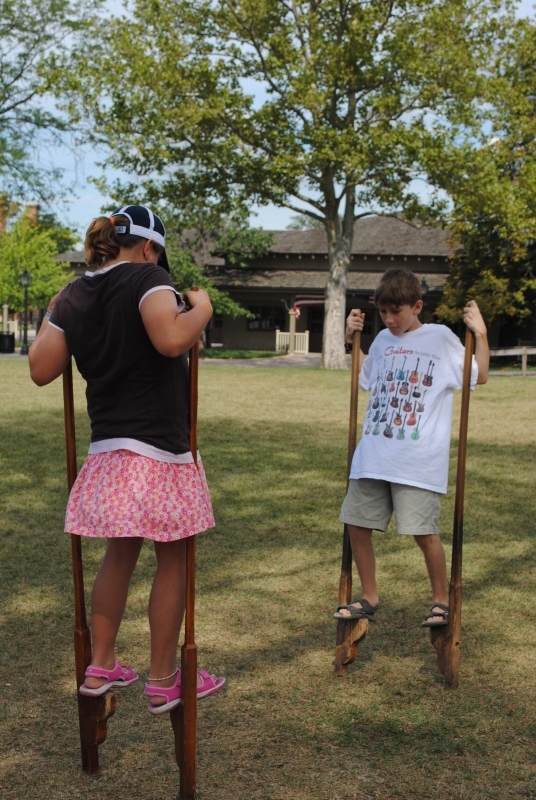 The stilts were the first thing the younger ones of the group (ages 10 and 11) wanted to try. The teens of the group hung back for awhile before they finally caved and decided to give it a try too. And then we were ready to sit down for lunch and watch one of the many shows around the Village. My daughter was delighted to discover that one of the actresses she performed with at a local theater not only worked at Greenfield Village, but was performing in the show we happened to sit down to watch. After lunch, we had just a little bit longer to explore the Village some more. One of my favorite buildings to visit is Thomas Edison's labs. Then we visited the home of Noah Webster. This kids had fun reading some of the old stories used to reach children to read. The teens got a kick out of some of the language. My daughter thought "civilly accosted" was particularly funny! As we waited for some of our party to return from another part of the Village, the other kids were able to just hang out and enjoy the company of one another. We then enjoyed a huge serving of ice cream as a great finish to a hot and enjoyable day. It melted fast and ended up all over the place, though some managed to get consumed. I have no pictures, but I wish I did! It was a funny sight. As we exited, I snapped this shot - satisfied faces after a day of learning. Recapping this day makes me want to schedule more field trips. I haven't been as good about doing that over the last few years. 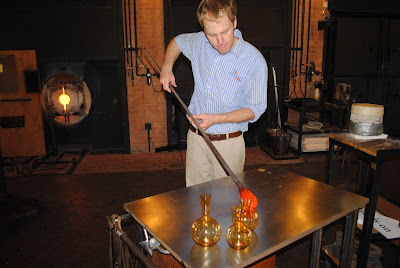 Field trips certainly aren't just for for elementary ages! Yesterday my son and I were on our way home from the doctor's office when I decided to pull into a garage sale. When the kids were younger, I used to garage sale all the time. I could always find great kids' clothes and toys for pennies on the dollar. Over the years, I've not gone to as many. My schedule is busier, finding clothes for older kids is more difficult, and I really don't *need* anything. However, I always love a good bargain and still try to get my bargain hunting fix in on occasion. We pulled up and this particular one and all I saw was a bunch of junk. My son, however, found his garage sale dream - a box of Legos with some miscellaneous toys mixed in. My son loves Legos. Even better, he loves digging through them and finding "rare" pieces. This box had potential and was sure to have some treasures. It wasn't marked with a price, my son asked what they wanted for it. "$5," was the answer. Sold! As soon as I snapped this picture, I had a flashback. 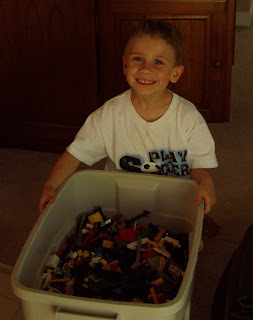 What started this whole Lego obsession was the best garage sale find *ever* when I discovered an 18-gallon tub plus a 10-gallon container full of Lego sets for only $20 for both, an unbelievable deal for hundreds dollars worth of Legos! 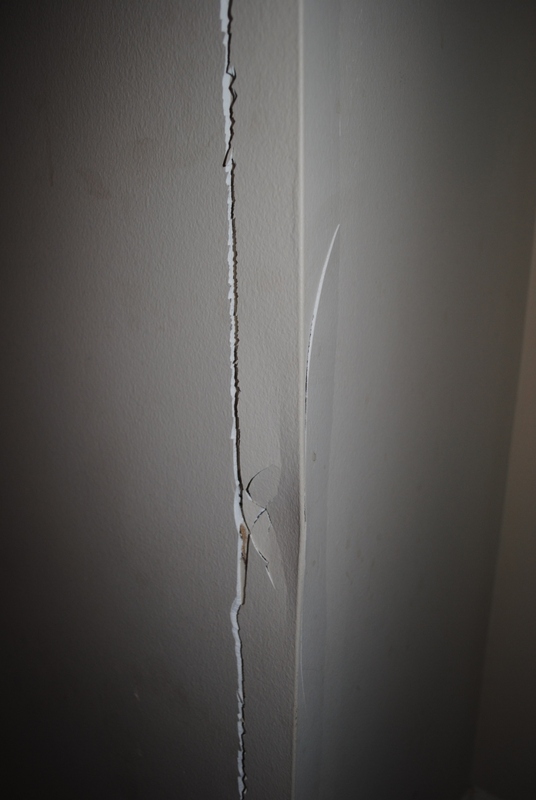 Here's the picture snapped way back when with just a portion of our find. 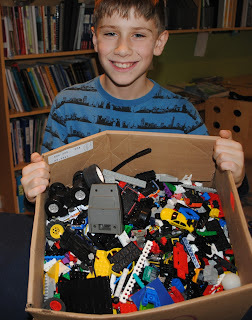 It has been seven years since our first big Lego find. However, I think he looks just as happy now as he did back then, don't you? I've been tagged twice! Last week, Michelle, at A Life Better Than I Deserve, tagged me with a list of questions, some of which remind me that I should start thinking about holiday shopping.Then, today Christine at Our Homeschool Reviews tagged me another 8 questions. I'm supposed to answer the questions posed to me, then in turn tag 8 people with my own questions, in an effort to get to know some bloggy friends a bit better. I'm going to combine my answers into one post. What type of gifts do you prefer to give? Do you prefer home-made, gift certificates, store-bought, etc? I usually go with store-bought gifts, simply because my talents for home-made gifts are limited. I do try to put a lot of thought into my store-brought gifts though! What type of gifts do you prefer to receive? I tend to be a bit practical and appreciate gift cards the best, through I have received home-made and store-brought gifts that I've really liked. Do you stock a gift closet, or box, and purchase gifts throughout the year? I used to do this quite a bit, especially for the kids. I don't do it some much anymore. If I see an item that I *know* will be appreciated by a certain person, I definitely pick it up for future gift-giving. What is your favorite type of music? Do you have one? I don't really have a favorite; it depends on my mood of the day! Do you like chick-flicks, or not? They are ok, but probably not my favorite. Do you have a hobby? Do you make time for it regularly? I don't have much time for hobbies. I'm still trying to learn how to knit, but there is such a time gap between when I work on projects, I have to relearn it each time! What is your favorite thing about where you live?Every place has its pros and cons.What are the “pros” about where you live? 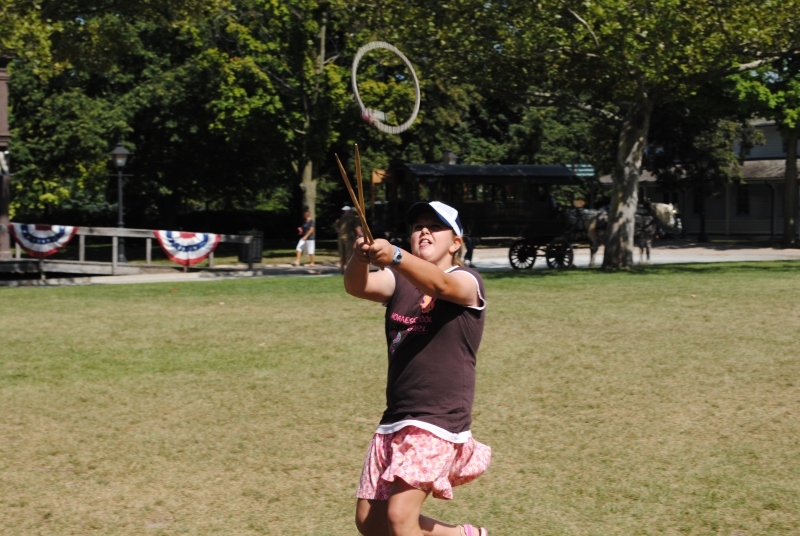 Our town has a small-town feel, but is really in a suburban area with everything accessible. What is your favorite kids cartoon movie? Hmmm - The Incredibles is the first that popped into my mind. Where were you born and do you live there now? I was born in Ohio, but didn't live there very long! What is the best vacation that you have ever taken? Cancun, Mexico. I loved visiting the Mayan ruins and wish we could afford to go back there with the kids. What is your favorite season or time of year? Christmas - but only when my shopping is done! Do you have a favorite place you like to visit with your family? Do you have a room set aside for homeschooling? Yes, we have a school room in a bonus room above the garage. How many children do you have compared to how many you thought you would have? I thought I would have two, because that is the number my husband and I agreed upon before we even got married. I would have liked to have more though! Whichever room is the cleanest and most peaceful at the time! 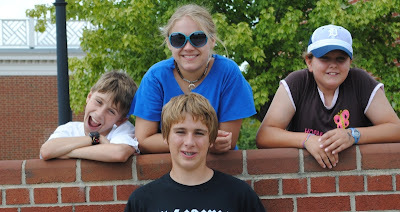 When I first started homeschooling, our family loved to do field trips. What better way is there to learn than with direct, hands-on experience? In those early years, with a preschooler and an early elementary student, I made it a point to do as many field trips as possible. One year I had coordinated over 20 field trips. Unfortunately, now that I have two in middle school, the field trips have dropped off the schedule and have been replaced with more demanding academics and a plethora of other activities. In addition, we've pretty much exhausted the field trip opportunities in our area. Then, we discovered digital field trips! Digital Frog, known for their virtual and interactive dissection software, provided me with a copy of The Digital Field Trip Series on DVD to review. 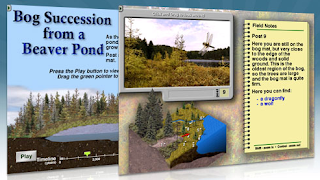 Having never heard of this product before, I first thought it was more of an educational program to watch, rather than what it is - an exploration of three ecosystems through an interactive CD-Rom filled with animations, written narration, video, quizzes, games, photographs, and more. Three separate virtual field trips, which can also be purchased individually, are included on the DVD. With The Digital Field Trip to the Wetlands, students explore Cloud Lake in Algonquin Park, Canada - all without getting their feet wet, of course! The five modules, Field Trip, Study of a Bog, Wetlands Types, Mechanisms of a Wetland and Our Endangered Wetlands are integrated into one fully interactive learning tool. Thirty-three wetland plants and animals are profiled. My son particularly enjoyed the Wetlands Quiz that has students identify what type of wetland (marsh, carr, swamp, or peatland) in each picture. 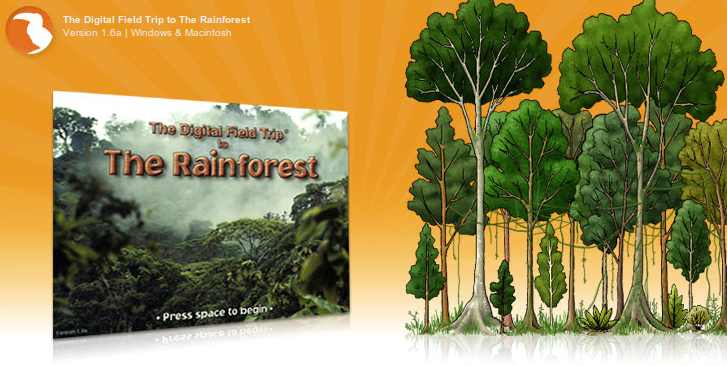 The Digital Field Trip to the Rainforest takes students to the Blue Creek Rainforest Reserve in Belize, Central America. 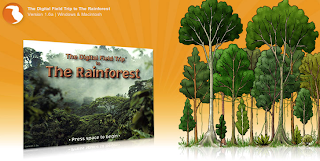 Similarly, five modules are also included: Field Trip, Rainforest Types, Rainforest Study, Mechanisms of a Rainforest, and Our Endangered Rainforests. There are 30 rainforest plants and animals covered and 29 movies. The Field Trip module was a favorite for this particular topic. The rainforest Field Trip includes 28 stops where the student can have a 360 degree view of actual footage. 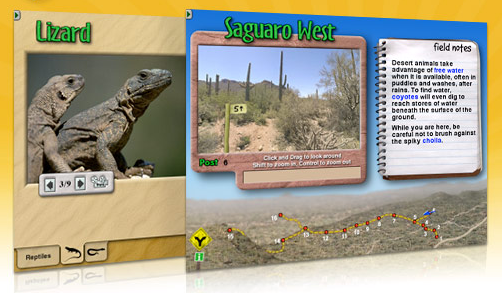 The Digital Field Trip to the Desert lets students experience five North American Desert locations. Virtual Field trips for each desert are included, as well as modules on Desert Types, Desert Study, Desert Mechanisms, and Human Impact. Of the three, my son claims this was his favorite virtual field trip of all. We spent some time together taking the Landform Quiz. Of course, my oldest was wanting to get in on the program too. Aside from being able to do a field trip from our schoolroom, the appeal of multiple ages is one of the things I really appreciated about this DVD series. My personal favorite feature was the Field Trip modules, where you could "look around" the area with your mouse, as if you were really standing there. The text feature is great for younger kids. Almost every word is defined and a click of the button will provide a pop-up box of the definition of a particular word. Audio of the pronunciation is even provided for some of the words. There is map feature that when clicked, gives you an overview of all the screens within the field trip. I found this very helpful to get back to a particular area already visited in previous explorations. Because the program doesn't follow a particular sequence, it wasn't always easy to remember how you arrived at particular videos or quizzes. A quick look at the map feature helped with navigation. 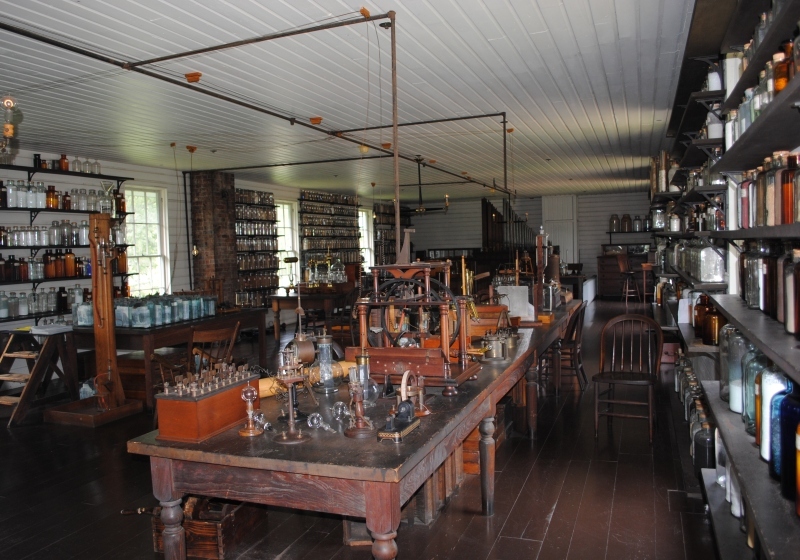 The program is designed to explore, much like a real field trip. It doesn't have a set way to go through it and the user just goes off in various directions to click, listen, watch, or play as interest leads them. There aren't unnecessary sound effects. Some screens are silent, some have appropriate background noise, while others have simple narration or video. The overall presentation is excellent and really draws in the user. Both of my kids enjoyed the DVD and my youngest has asked on more than one occasion to go through it again. It doesn't surprise me, because much like a real field trip, you really can't take it in all at once. 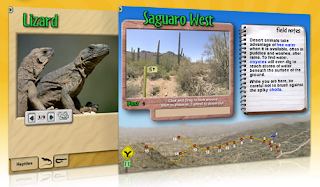 Each Digital Field Trip (Wetlands, Rainforest, Desert) can be purchased individually under a home license for $60 or combined on the Digital Field Trip Series DVD for $125, an over 20% savings. If you would like to try before you buy, limited demo versions are available of this product and others offered by Digital Frog. Visit the Digital Frog website for more information or to purchase. While the holidays should be a joyous occasion, I know many families are worried about tight budgets and making ends meet this year. Our family is among those watching pennies and I'm already thinking about Christmas so I can spread out gift expenses. However, when I look at others around us, I'm blessed to even have a budget for gift purchases. We still have food on our table and a roof over our heads. I can't imagine being homeless for the holidays. I recently had the opportunity to review a new release, Homeless for the Holidays, addressing this very, and not uncommon, scenario . This 2009 Christian production, that was previously in limited release theatrically, is now available on DVD through various Christian retailers - just in time for inspirational holiday viewing for the family. The movie, based on a true story, is about Jack Baker, a wealthy executive who loses his job. At first, he's confident he'll get called back to work any time. As time goes on, Jack comes to the realization that things might not be so optimistic. In desperation, Jack eventually finds himself working at the local burger joint, further humiliated by a required penguin suit uniform. While now employed, it isn't enough to make ends meet and Jack and his family are faced with the real possibility of being homeless within days of Christmas. Of course, along the way, Jack has some lessons to be learned about himself and others. The message is so appropriate for today's time and it is no surprise it is based on a true story. While the topic is depressing, the film is not without plenty of comedy, as well as inspiration, and will be enjoyed by the whole family. 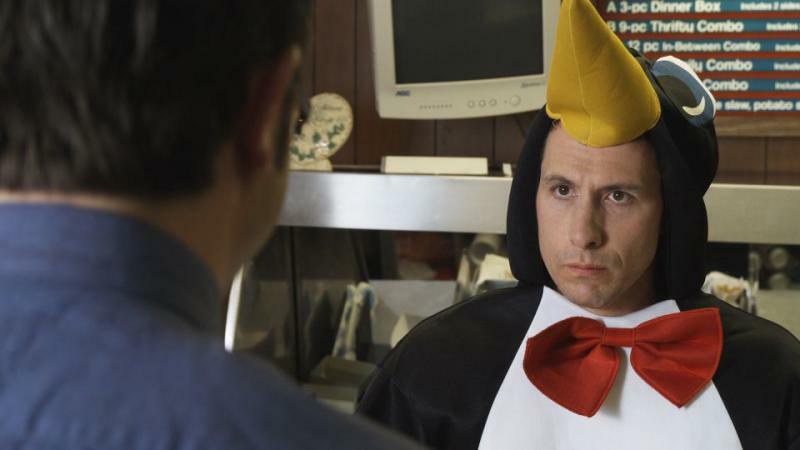 Matt Moore, who has an unreal resemblance both in looks and style to Adam Sandler, played the lead as Jack Baker and was excellent. I later found out that all of the actors volunteered their time, which more than made up for the variances of acting ability. And for some of the cast, this storyline was all too real. You can read more about the story behind the movie and the cast here. As a homeschooler, Homeless for the Holidays gets bonus points for being about a homeschool family. It isn't highlighted nor even mentioned, but confirmed with a background line of the mom ending the school day with the kids and also one mention of mom as the teacher. I liked the subtle reference, which presented homeschooling as normal enough to not be highlighted. What I most appreciated were some of the behind the scenes included on the DVD, like footage of the auditions and a video diary by the producer. It confirmed for me what I already suspected - this production was created with passion and family like fellowship, unlike a Hollywood production. In fact, the producer, an unemployed father of four, took a step in faith and funded the entire project. Through the hard work and the volunteered time of others, the entire film was shot for only $20,000. You can read more about the movie and the production at the Breathe Motion Pictures website. For me, the background of the film more than made up for the shortcomings of not having a big Hollywood budget. 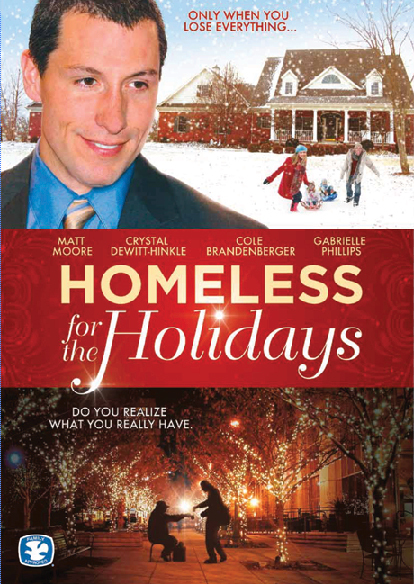 Homeless for the Holidays is inspirational not only in its message, but how it came to be. NOW CLOSED! Now, for the exciting news! 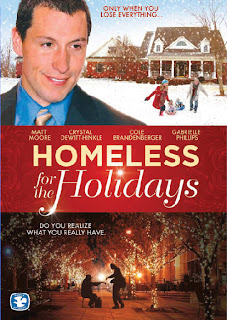 I have an extra copy and you have an opportunity to win your own Homeless for the Holidays DVD. The giveaway will end on October 22nd at 6 p.m. EST and will be chosen by a random number generator.U.S. and Canada only, please. Author Matthew Christian Harding's storytelling days first began at the requests of his young children at bedtime. His creative tales would sometimes last for months as he developed characters and wove intricate details into the storyline. Then, one day his wife, unaware of the verbal escapades going on in the evening, began to sit in on the storytelling and soon became his biggest supporter in putting his stories to paper. Foundlings, Harding's first novel, is the result of that encouragement. 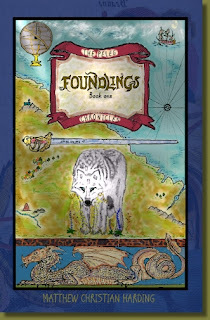 Set at the time of the Tower of Babel disbursement, Foundlings is described as a cross between Christian fantasy and historical fiction. It attempts to give an accurate portrayal of the confusion and mayhem that may have taken place at that time, with wandering beasts, confusion of languages, lost and retained technology, and conflicting groups and religions. The author brings this story to print with a strong intended message, rather than just entertainment, and categorizes it in a number of ways, including Creation Fiction, Leviathan Literature, Behemoth Books and Young Earth Dragon Fiction . 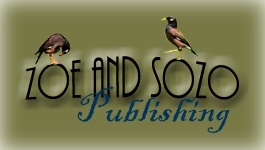 You can read about the author and his explanation of these categories at the Zoe and Sozo Publishing website. There be dragons. There be giants. And God: our maker, our help, and our righteous judge." The Warrior's broad hand rested upon the eager shoulder of the boy. "Does it not stir your soul?" It was in the days of Peleg, when the world was divided. After the flood of Noah, after the tower of Babel and the dispersion, when men wondered where they were upon the earth, and where their fellows had gone to, when beasts were more numerous than men - predators in the world, in the water, and in the air. But men struggled and fought, carving their place. And in the process of time they once again began to multiply upon the face of the earth. The story revolves around the the plight of two child characters, Susie and Thiery, to escape from becoming sacrifices by dragon cultists. Sir McDougal, his shield-bearer Fergus, and dwarf Gimcrack come both to their assistance and put themselves in danger as well. When I read the synopsis of Foundlings, I was excited to dig in. I appreciate fantasy fiction and thought the setting and time period quite unique. My 13-year-old daughter picked up the book first. When I checked in with her later, she told me storyline was a bit slow going and she had set it down for awhile. After picking up Foundlings on my own, I had to agree. It took me a good 100 pages to start to get wrapped up in the storyline. There was a bit of jumping from scene to scene and numerous introductions of characters, that initially it was a bit hard to follow. However, while I did eventually pick up on the concurrent story lines and able to see how it all fit together, it wasn't the only issue I had. Though the book as a whole comes from a Christian perspective, there was a dark element to Foundlings that interfered with my enjoyment of the story. I found the Dragon Priests, with their hooded attire and dragon tattoos, along with their drive to find human sacrifices, to be a bit creepy for the age range intended for this title. There are no gory details, but there was one scene that described the beginnings of a “Cozen Sacrifice” where the victim, being prepared by her soon-to-be graveside, was rescued from a drugged Dragon Priest. Granted, good always prevails and the victims and characters of the story are never actually sacrificed, but I felt there was too much emphasis on the cultist and evil element for the target audience (ages 10 and up). I typically don't have such a reaction to well-placed and purposeful evil in a storyline and have greatly enjoyed other fantasy fiction with a good versus evil plot. In fact, I tend to have a difficult time with books that are all rosy and predictable. I really liked the premise of the book. However, it wasn't one that I particularly enjoyed. As a result, I didn't require my daughter to complete the book, especially since it hadn't already grabbed her, and did not suggest my son read the title. However, many of my fellow Crewmates did enjoy Foundlings and I suggest you visit the Official TOS Crew Blog to read their reviews for another perspective. If this is a title that you suspect you may enjoy, you will also be interested in the second book in the series, Paladins, that picks up from the absolute cliff hanger in the first book. A third in the series, is planned for May 2011. Foundings, offered through Zoe and Sozo Publishing, can be purchased for $11.95 at the author's website, local bookstores, and through major online retails. It also comes with a “Good Read Guarantee”. If you or your child doesn't love the book, keep your copy, and they'll send you your money back. The Schoolhouse Planner, plus something new! Many of you know about the Schoolhouse Planner offered by TOS; I've talked about them and the related Modules here on my blog in the form of reviews (my first ever review in 2008!) and even as part of an ad contest (I tied for first!). Each year, TOS makes the planner bigger and better, adding more features and forms, more recipes, and more articles. This year, they've offered a completely new, but related, product to the line: student planners! One of my goals this year is to get my daughter to manage her time better. Unfortunately, it is a skill I didn't learn at a young age and which is still a struggle. I have not seen these new student planners yet, but I'm excited at the possibilities of it as a learning tool toward independence and responsibility. 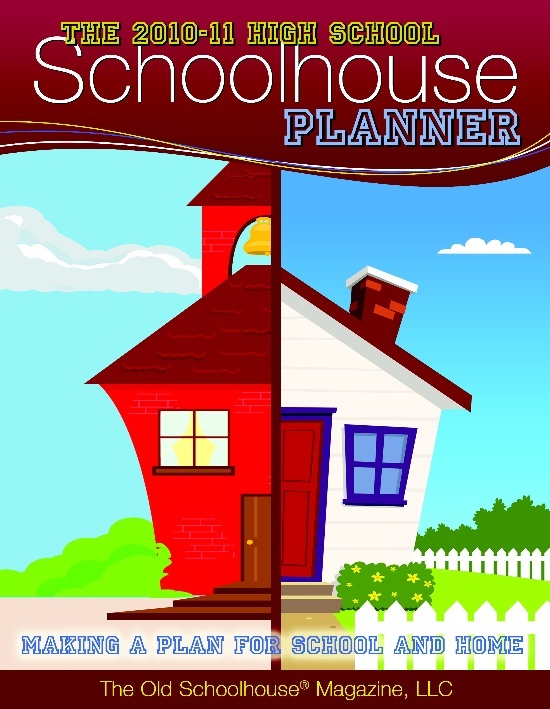 I'm specifically looking at the the High School Student Schoolhouse Planner for my oldest, but there are also planners for primary and middle school students as well. 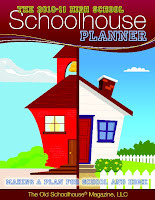 You can see the complete line of e-book planners at the Schoolhouse Store here. Disclaimer: I have not used nor viewed this item. As a result of my sharing the news of the new planners with you, I will be entered into a drawing for a gift certificate prize.